Eric Locsh is a writer and digital marketing copywriter based in New Jersey. He found his inspiration to be a writer from the stories he read as a child and the trips he went on with his family when he was younger. Growing up in a relatively quiet suburban neighborhood afforded Eric the opportunity to create unusual places he could only dream of visiting, until now. Before realizing he wanted to be a writer, Eric explored many different fields in college—studying accounting, geology, teaching—before ultimately landing at journalism. Eric wrote the first draft of The Tower of Blue entirely by hand. He thinks this practice creates a more personal approach to storytelling, allowing the story a greater opportunity to connect with readers. Reflecting on past mistakes, old ideas, being able to look back on how your writing has improved can all get lost on the screen. The Tower of Blue by Eric Locsh is an epic adventure that begins with a completely naked Mr. Blue forcing his way into his neighbor's house so that he can call the police to report that his house was robbed, including his phone. Amidst all of the chaos between the shocked neighbors trying to usher Mr. Blue from their house, and Mrs. Blue trying to see if her son, Arnold, is okay behind his closed bedroom door, the police arrive on the scene, and find out that everything is gone. The house was robbed of all of the family's possessions. The scene then changes to Arnold pushing a tower that he had built using every last bit of his family's belongings. His reasoning is to find a better home for him and his newly acquired tower on wheels. He decides to head east after hearing of a Utopian society known only as the Kingdom. Eric Locsh does an absolutely brilliant job of relating Arnold Blue's emotions, convictions, and reasoning behind his trek of epic proportions. The quirky characters that Arnold meets along the way are as odd and diverse as Arnold's tower, that just happens to be complete with a kickstand, and everything that our hero could think of using. The author has created sub cultured sci-fi communities as diversified as their unique cities. Arnold has to deal with some overbearing parent types that offer to help him along the way. It kind of reminded me of Dorothy's trip through the land of Oz, but on a slightly darker scale with conservationist sub plots enough to give the story additional characters. These help shape the story as Blue comes to terms with meeting new people that help him with his inner struggles. 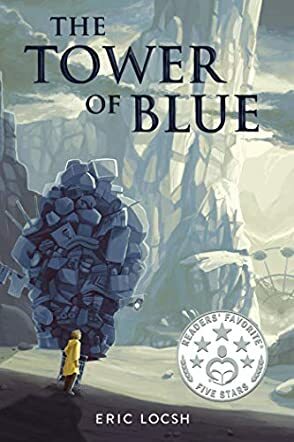 The Tower of Blue is a great read and was hard to put down as Arnold's will power to keep in pursuit of his quest for a better life prevails. Bravo! WAS NOT ABLE TO PUT IT DOWN THE MORE YOU READ TI THE MORE YOU WANT TO READ.